Even those who are passionate about gardening constantly need to keep their tools in order. The best choice? Purchase a garden tool rack, a convenient and best solution to keep your gardening tools tidy. When it comes to gardening, it is always very useful to have a good rack with you. 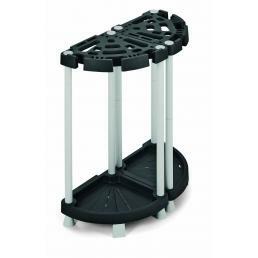 In the Mister Worker™ catalog a high quality plastic Terry rack is available, designed specifically for outdoor use: it resists wind and rain, and is stable and roomy, ideal for racks, spades and blades. To make it even more stable and safe, especially if you have to keep it outside on days when the wind is particularly strong, you can reinforce the base by placing weights, such as sand or pebbles. The high quality material with which the rack is produced means that it can be used repeatedly by several people, because it resists the continuous insertion and removal of garden tools. It is shipped disassembled, but it has been designed to be assembled very easily in a few minutes, to fully satisfy even those who are not a great expert in assembly. The light but solid and stable material allows to drill holes on the back to fix the rack to the wall; alternatively, it is possible to fix it with professional adhesive tape or with specific adhesives for the plastic that resist the rain or, if positioned near a railing, it can be fixed to it with tightly tied clamps. To keep it always stable, however, it is always very important to balance the weights placed inside. A garden tool rack helps to solve space and order problems in your tool storage room, and choosing it with good quality is essential to avoid meeting up with a small or hard-wearing product.